Facultative: plant is equally likely to occur in wetlands or non-wetlands (probability 34%-66%). Facultative: plant is equally likely to occur in wetlands or non-wetlands (probability 34%-66%). Minus sign indicates tendency toward the lower end of the category (less frequently found in wetlands). Facultative: plant is equally likely to occur in wetlands or non-wetlands (probability 34%-66%). Plus sign indicates tendency toward the higher end of the category (more frequently found in wetlands). Facultative Upland: plant usually occurs in non-wetlands (probability 67-99%), but occasionally found in wetlands (probability 1%-33%). Facultative Upland: plant usually occurs in non-wetlands (probability 67-99%), but occasionally found in wetlands (probability 1%-33%). Minus sign indicates tendency toward the lower end of the category (less frequently found in wetlands). Facultative Upland: plant usually occurs in non-wetlands (probability 67-99%), but occasionally found in wetlands (probability 1%-33%). Plus sign indicates tendency toward the higher end of the category (more frequently found in wetlands). Usually occurs in non-wetlands but may occur in wetlands where soils are rarely saturated. May occur in non-wetlands, but usually occurs in settings where water saturates the soil or floods the soil surface at least seasonally. Facultative Wetland: plant usually occurs in wetlands (probability 67%-99%), but occasionally found in wetlands. Facultative Wetland: plant usually occurs in wetlands (probability 67%-99%), but occasionally found in wetlands. Minus sign indicates tendency toward the lower end of the category (less frequently found in wetlands). Facultative Wetland: plant usually occurs in wetlands (probability 67%-99%), but occasionally found in wetlands. Plus sign indicates tendency toward the higher end of the category (more frequently found in wetlands). A flap of unspecialized tissue, such as an inrolled leaf edge, that covers and protects the sorus of a fern. The grouping in a taxonomic hierarchy that encompasses related genera. Inflated hairs that create a mealy coating on a surface. With leaflets or needles in a bundle or compact cluster. Environmental legislation signed into law by President Richard Nixon in 1973, designed to protect critically imperiled species from extinction. With openings or window-like slits. A non-flowering plant that produces spores, which themselves germinate to form sexual plantlets whose offspring in turn become the spore-bearing plant. 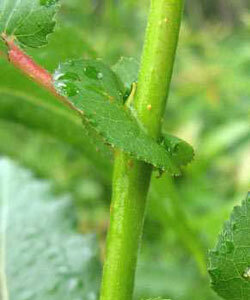 The stalk supporting the pollen-bearing structure (anther). Succulent, with a high water content. Sinuous, curving alternately in different directions. An area adjacent to a river or a stream which floods during periods of high discharge . Small or single flower (disk or ray floret in Asteraceae, flower plus lemma and palea in Poaceae). Second-year flowering stem of Rubus. The reproductive structure of a plant. Like a leaf in form or texture. A dehiscent fruit with a single ovary, that splits along a single seam on one side of the mature carpel to release the seeds. Herbaceous plant usually less than 2 meters (6 feet) tall. Area dominated by trees with branches and foliage that meet or interlock to form a continuous canopy although there can be gaps of varying sizes. A scale or appendage in the corolla tube of some Boraginaceae. Not fused with another dissimilar structure. The leafy part of a fern, including the stipe (petiole) and blade (pinnae). The mature or ripened ovary and any associated structures that ripen and unite with it. Shaped like a flaring tube (funnel). Narrowly tapering at both ends and fat in the middle (spindle-shaped).